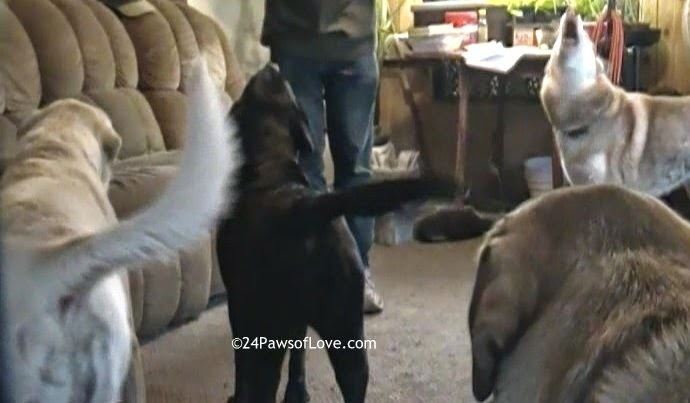 24 PAWS OF LOVE: Dogs are AWESOME!! In so many ways but love and communication is the best. Have a wonderful Wednesday. You do realize there are crazy people in the world who would not find 6 dogs howling in the morning their idea of awesome. My dog is awesome because she's learning how to do things that used to scare her. It's a good lesson for us humans. It's never bad to be scared. But it's really awesome if we can find a way to do things even when we are scared. Elka is awesome because she's very sweet and gentle if one of us isn't feeling good. She's awesome because she tries her hardest to talk to us, and seems genuinely confused when we don't understand her. I'm with you! I can be having a terrible day and all I have to do is look at my girls and...magically my day is better! I love seeing LadyBug overcome things she used to be terrified of! I just could not live my life with my dogs!! That is too cute and clearly would put a smile on your face! Sage's energy is something I love to watch. Her anticipation knowing we are going on an 'adventure' always brings a smile to my face.